What Changes Everything is truly an American story on an international stage, told through an ensemble of heartening characters. In a gamble to save her kidnapped husband's life, Clarissa Barbery makes the best decisions she can in the dark nights of Brooklyn. Stela Sidorova, who owns a used bookstore in Ohio, writes letter after letter hoping to comprehend the loss of a son on an Afghan battlefield and to reconnect with the son who abandoned her when his brother died. And Mandy Wilkens, the mother of a gravely wounded soldier from Texas, travels to Kabul to heal wounds of several kinds. At the same time, What Changes Everything is the story of two Afghans who reveal the complexity of their culture, the emotions that hold it together and those that threaten to fracture it. These lives are braided into an extraordinary novel about the grace of family. 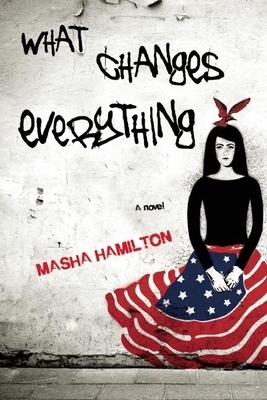 Masha Hamilton is the author of four acclaimed novels, most recently 31 Hours, which The Washington Post called one of the best novels of 2009, and independent bookstores named an Indie Next choice. She also founded two world literacy projects, the Camel Book Drive and the Afghan Women's Writing Project. She is the winner of the 2010 Women's National Book Association award, presented "to a living American woman who derives part or all of her income from books and allied arts, and who has done meritorious work in the world of books beyond the duties or responsibilities of her profession or occupation." She began her career as a full-time journalist, working in Maine, Indiana, and New York City before being sent by the Associated Press to the Middle East where she was news editor for five years, including the period of the first intefadeh. She then moved to Moscow where she worked for five years during the collapse of Communism, reporting for the Los Angeles Times and NBC-Mutual Radio and writing a monthly column, "Postcards from Moscow." She also reported from Kenya in 2006, and from Afghanistan in 2004 and 2008. A Brown University graduate, Hamilton has been awarded fiction fellowships from Yaddo, Blue Mountain Center, Squaw Valley Community of Writers and the Arizona Commission on the Arts. She has taught for Gotham Writers Workshop and the 92nd Street Y in New York City and at a number of writers' workshops around the country. She has also taught in Afghanistan at Kabul University. Masha Hamilton is the Director of Communications and Public Diplomacy for the U.S. Embassy in Kabul, Afghanistan.